Reynaldo Decerega’s inadvertent elbow to the face of President Obama (right) resulted in 12 stitches and unwanted publicity. WASHINGTON — It took 849 days for the man who threw the elbow heard ’round the world to finally talk about it. On Nov. 26, 2010, President Barack Obama was accidentally smacked in the kisser by Decerega’s elbow in a pickup basketball game. The leader of the free world received 12 stitches in his upper lip. Decerega took four stitches in his right elbow and the weight of the world on his mind. After The Elbow, Decerega crafted a short statement that the White House released, calling the president “a tough competitor and good sport” and then asking for privacy. He focused instead on his jobs as programs director for the Congressional Hispanic Caucus Institute and as a basketball trainer and coach. He became a US citizen, and the first ballot he cast was for Obama in 2008. Basketball helped him in life, he says. A former history teacher, he has coached basketball for elementary and junior high students for the past 20 years. He got his master’s degree and headed to Capitol Hill, where he helped develop a pipeline for future Latino leaders. His accomplishments were impressive. The Spanish Embassy sent him to Spain as a young leader; he attended an executive leadership program at Harvard’s Kennedy School of Government; and he was chosen by MillerCoors in 2010 as one of a dozen top Hispanic leaders for achievement, vision, and commitment. He also started training young players for One on One Basketball Inc., an instruction and event management company that works with players of all ages and skill levels. He spearheaded trips to Panama and the Canary Islands to spread the gospel of basketball. Today, none of the kids he has coached knows about The Elbow. “But all the grown-ups do,” he said. “It in no way defines him,” said Charles Milligan, whose 11-year-old son Brandon has worked with Decerega for years. The invitation to play with the president came through Arthur Jackson, the founder of One on One Basketball and a former Brown University cocaptain. “When I got the invitation, it was like, ‘Wow!’ ” said Decerega. “I was not scared. In my life, basketball has been one of the threads. I just felt I was adding another chapter to my basketball story. The first game was at Camp David, where the presidential seal is at midcourt. Nice Guy Rey was on Obama’s team as a wing guard. The participants were mostly cabinet or family members, younger than the president. Decerega, right, instructing Brandon Milligan, is a trainer at One on One Basketball. At 6 feet 1 inch, Decerega is the same height as the president, who played high school ball in Hawaii, but he’s 11 years younger and 20 pounds stockier. Picture a Latino Ernie DiGregorio. He says the lefthanded Obama has got game. And the commander in chief is not quiet on the court. The president even singled him out for praise. 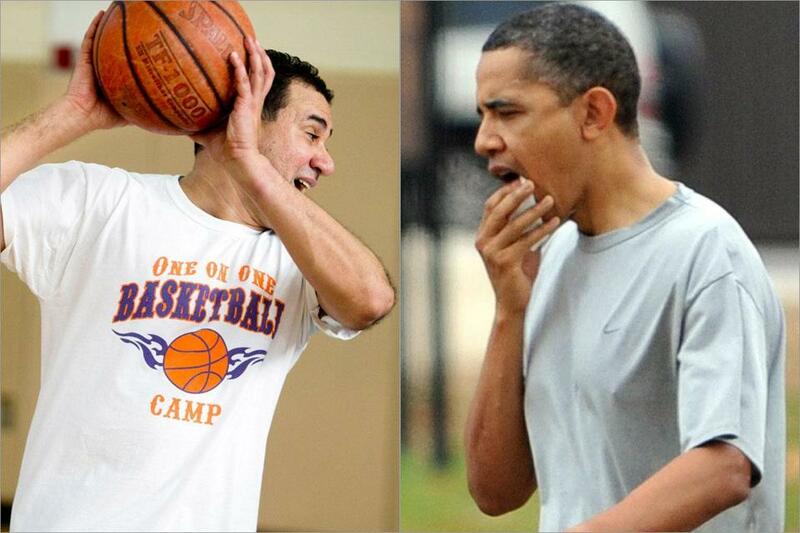 In 2010, Decerega guarded the president during his second pickup game at Fort McNair, the day after Thanksgiving. Reports on whether the president gets special treatment on the court are conflicting. Hall of Famer Scottie Pippen, who played with Obama on Election Day last fall, thinks so. “I thought they were bringing the whole motorcade through the lane it was so wide,” Pippen told Bulls.com. Decerega, who was not invited back after The Elbow, says the leader of the free world is treated like any other guy in T-shirt, shorts, and sneakers. “If you didn’t know, someone would have to tell you which player is the president,” he said. When it comes time to discussing The Elbow, Decerega hesitates before speaking. Decerega shoots both his hands skyward, demonstrating what Obama did that day. “He was crowding me,” he said. “Instinctively, you crowd the person you’re guarding once he stops his dribble. And instinctively, as the offensive person, I felt the pressure, so I was trying to clear some space. You swing your arms to see what options you have. “So I swung the ball from my left side to my right side. And in that swing — I’m obviously leading with this elbow — I hit him in the lip and he fell to the ground from the contact. And that’s a very surreal moment. “I didn’t know what had happened, so I looked at my elbow and there’s blood coming from my elbow,” he said. “He was just holding his lip on the floor. He didn’t yell. The Secret Service didn’t tackle Decerega; initially, in fact, no one said anything to him. The president returned to the White House for stitches and ice packs. 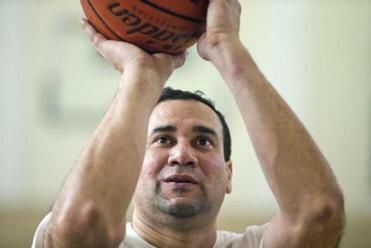 Decerega drove himself to Alexandria Hospital and told the doctors he injured himself playing pickup basketball. He never mentioned Obama. CNN’s Wolf Blitzer was on his trail. He received e-mails from haters who said he should have hit the president harder. His sister in Indianapolis was contacted. His mother was worried that there would be physical reprisals. Decerega was having trouble sleeping. Then he remembered the advice of his old high school coach at St. Stephen’s, Win Palmer. “He taught me to be a class act in everything you do,” said Decerega. He penned a note of apology and sent it to the White House, then tried to concentrate on work. Three days later, he received a large gift-wrapped package with the presidential seal on it. It contained a framed three-picture sequence. “Him guarding me, me swinging through, and then him holding his mouth,” said Decerega. Decerega was more than grateful. “I was shocked again,” he said. “I mean, for him to take the time to think about me, and offer me that, it’s an incredible gesture. But Decerega knows that he’ll always be associated with The Elbow.